This line is different again – more like the earlier stems I owned. identifiesthe etch as “Victoria” not Victory. Given that the stem is different I wonder if the pattern is still the same. Likely just a variation between Czech glass houses using the same design. If any one knows, please share the info! 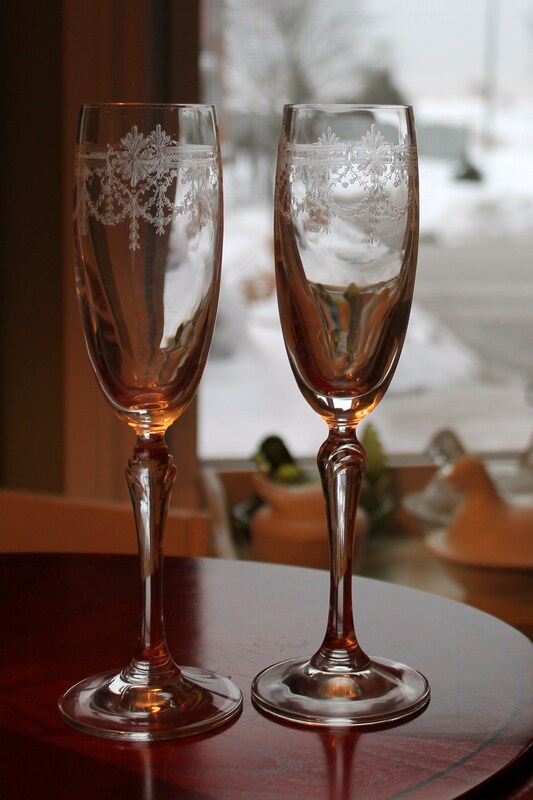 Picked up these two champagne flutes recently. At first I thought they were a match to another etch I have. 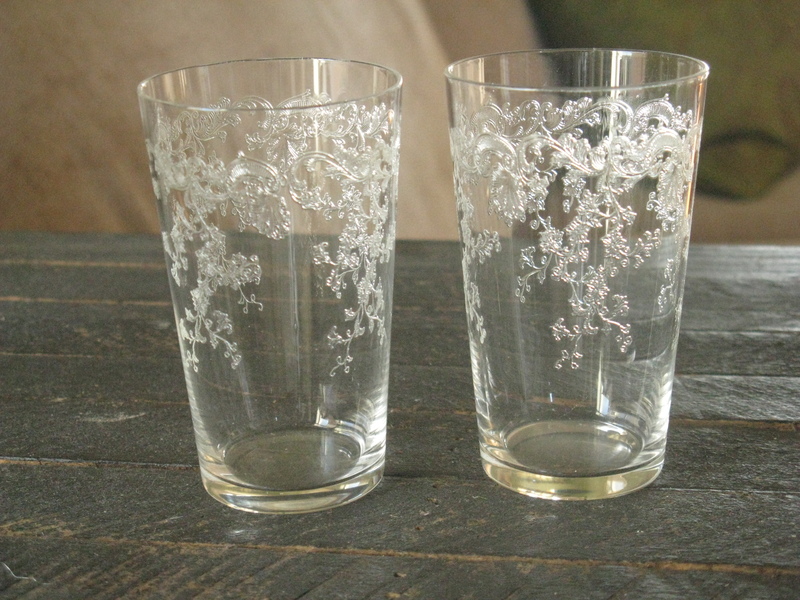 Check out the details on the D’Arques wine glasses with the Dampiere etch. Very similar. Heisey also has an etch – Osage – that has similar details as well. In any event the stems were the first clue, and the a closer look was the second clue. I still don’t know any more about the provenance of these stems. But they are pretty. Original January 15, 2012 post. 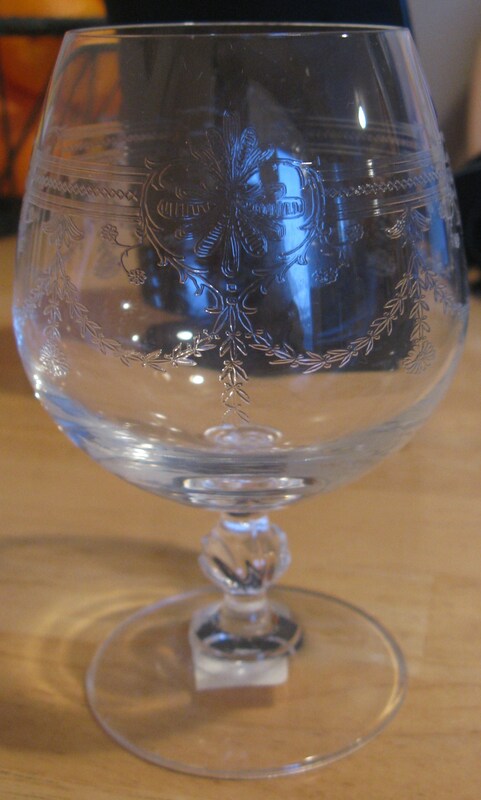 I bought three snifters recently at a local antique shop. I have only seen this etch on the Replacements, Ltd. site – www.replacements.com. They didn’t have any stems for sale at the time and I don’t see the pattern there any longer. If you haven’t seen this site before, definitely take a look. It indexes literally tens (if not hundreds) of thousands of patterns of china, silver, crystal, etc. I have one of their publications that provides sketches of etches. It took me awhile to track this etch down, but it appeared to be the same as the etch that had been identified as Bohemia’s Victory etch. 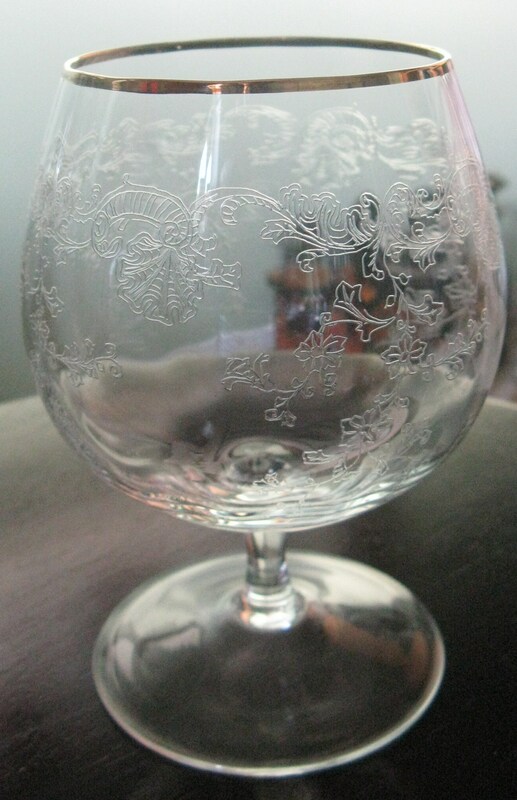 I don’t know much about Bohemia Crystal but I believe that they were/are imports from Czecholoslovakia. Some of their patterns are quite common. I also had some pretty sherry stems that were shaped like small flute champagnes. A friendly ebayer emailed some details of the crystal as it was her wedding pattern. I somehow deleted that message, big dolt, but would love to hear from someone else who knows more about it. They are very dainty. A smaller version. I am going with the Etoile ID. Finally after three years someone out in cyberspace has corrected an ID for me. Love it. That’s why I started this blog in the first place. 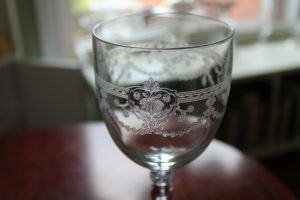 The gold rim glass is confirmed by someone whose sister collects this pattern, as Bohemia Etoile. Over the years I have had a number of pieces with the gold rim and the etch and knew that I had never confirmed the blank. It is great to have this corrected and identified. I don’t know if the small glasses below are part of this pattern however. There is no gold rim and Replacements doesn’t include this shape in its listing of Etoile. Also, I think these pieces are older. The glass is much thinner and if I recall, as I haven’t seen them for awhile, I think the etch is finer. Lotus/Glastonbury has a very similar etch called Garland #1001 and the St. Louis Cleo etch is also very similar. All about the shape/blank in the end, isn’t it? Intriguing. Thanks to the person who had identified the Etoile pattern however. Original post – May 31, 2012. I have to update this prior posting with a new photo. 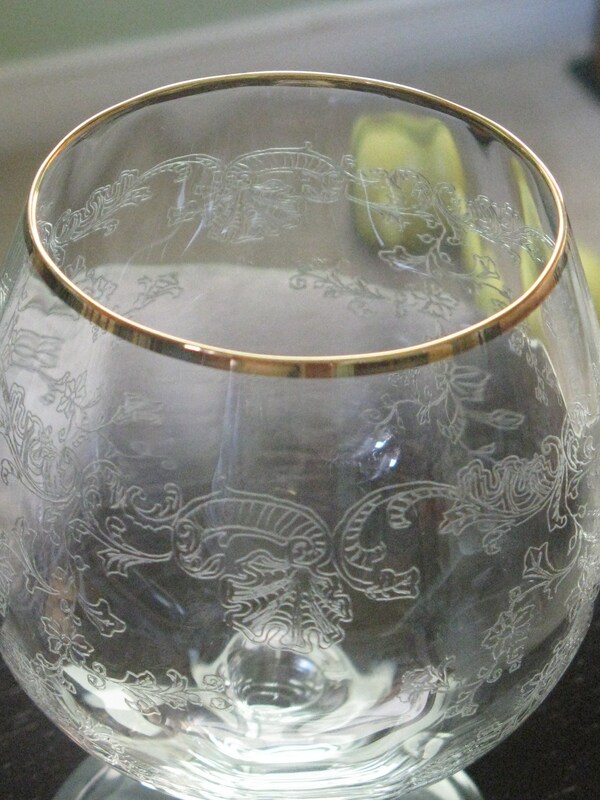 You’ll notice that the etch is the same, but larger, not as detailed, and the rim is gold. The Queen’s Lace has the gold encrusted pattern, so I still don’t know what this is. 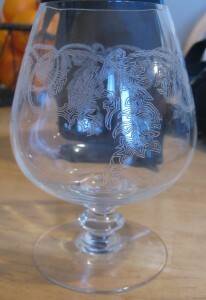 I have these two snifters, and a couple other pieces, yet to be shown. This etch is a bit of a mystery. I bought 8 of these little glasses in town here. The seller, Marie from Under the Toadstool, said that they had belonged to her mom, but she didn’t know anything about them. They are very small ( 3 1/2 in with a 2 1/8 inch opening) and don’t have the shape that I’d associate with a liqueur or cordial glass. I think of those glasses being more cylindrical, these have a slight flare, if that’s the correct word. 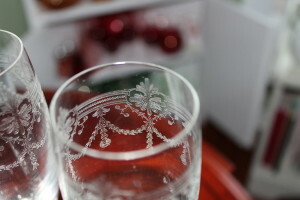 I have this etch on two water goblets and a decanter. I have seen it identified as Bohemia Crystal’s Queen’s Lace etch and as St. (Saint) Louis Massenet. 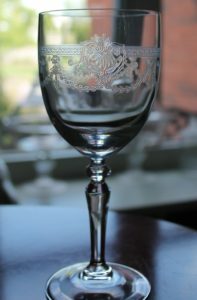 However the Bohemia pattern is always shown with a particular stem and the St. Louis pattern has the etch encrusted with gold. 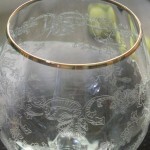 My other pieces have a stem I’ve not seen with this pattern, and gold along the rim, but not in the etch. No markings on anything. 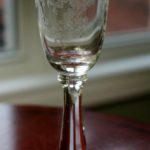 The glass is very thin. They look old. 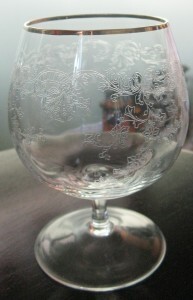 Here’s another Bohemia etch – Thistle. I have owned a number of pieces of this etch. Fairly common but popular I think. 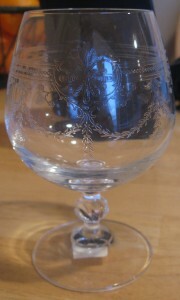 It resembles Tiffin’s Thistle etch.